It may not be well known, but iOS has several ways to save things as PDF and print webpages and other documents as PDF files. While one of the most popular methods involves using 3D Touch, another PDF generation approach is available to devices without that capability, and instead relies on a gesture trick to save something as PDF. The advantage to saving PDF files with the gesture method is that it works on iPad as well as iPhone and iPod touch, covering a much broader range of devices. It’s quite simple too, though it is completely hidden from any obvious user interaction. We’re going to demonstrate this great PDF saving trick by saving a webpage as a PDF on iPhone, iPad, and iPod touch, but it works the same with other document types from common apps like Notes, Pages, Numbers, and many others. You’ll need a modern version of iOS 10 or newer to have this special save PDF gesture feature, it is not included in old releases, so update your device if need be. You can save the generated PDF to iCloud Drive, or to multiple other services and apps, including iBooks, Dropbox, Kindle, and more. You can also choose to just share the saved PDF file by way of Messages, Mail, or AirDrop too. 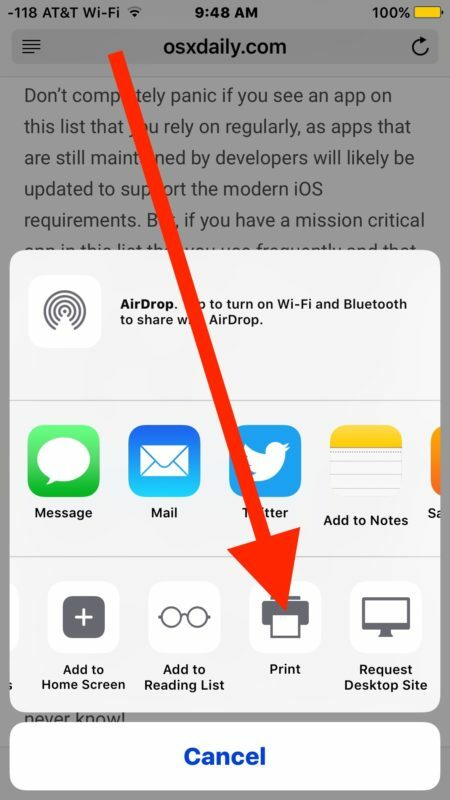 Why such an important and useful feature as saving as PDF is hidden behind a gesture on an obscure print screen is a bit of a mystery, but perhaps future versions of iOS will make this more obvious and easier to access directly in the Sharing menu. This is not the only way to accomplish PDF generation in iOS, in fact you can use the aforementioned print to PDF with iPhone 3D Touch trick which is also accessed from the Print screen, or you can even save webpages to iBooks app as a PDF file in iOS using the simple sharing and save menus, though you will obviously need the iBooks app installed on the iPhone or iPad to do that. Thanks to Luis for leaving this great alternative PDF saving option in our comments! 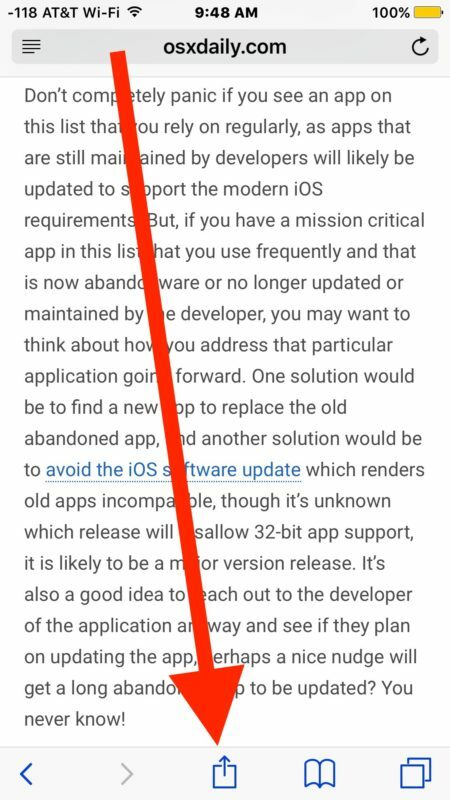 Do you know of any other handy PDF saving, generation, or modification tips for iOS? 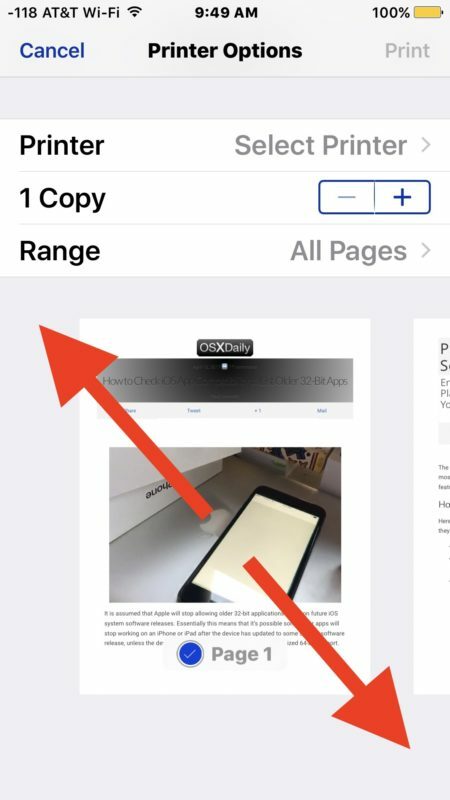 Do you have a favorite PDF trick for iPhone or iPad? Let us know in the comments! In other words, the PDF is being generated when the webpage at print screen is pinched out. Exactly, or when you hard press if you have a 3D touch capable device (iphone 6s or later). The advantage is that this method, whether used with or without 3D touch, works from any app that allows printing. Here Paul used safari as an example but it also works in mail, notes, ibooks, the iworks suite (pages, numbers and keynote) and any other app where the share sheet shows the print icon. When a Safari website allows it, I use Safari Reader to give the website a much better appearance before I convert the website to a PDF, in my iPhone, iPad Pro, or Mac. I do that too. There’s also the advantage (or maybe disadvantage to some) that when using this method to convert to pdf, the URL doesn’t appear at the bottom of every page as it does when using the ‘save pdf to ibooks’ button from the share sheet. This does not work to save a PDF to Photos – it works for jpegs. > It’s quite simple too, though it is completely hidden from any obvious user interaction. You could say that about anything associated with the iPad. Or you could select the share button and select “Save PDF to iBooks”. This will also save the pdf to iCloud if you have it setup so you can view it on any devices you use and are signed in to with your Apple ID. Yeah but that’s a more limited approach. 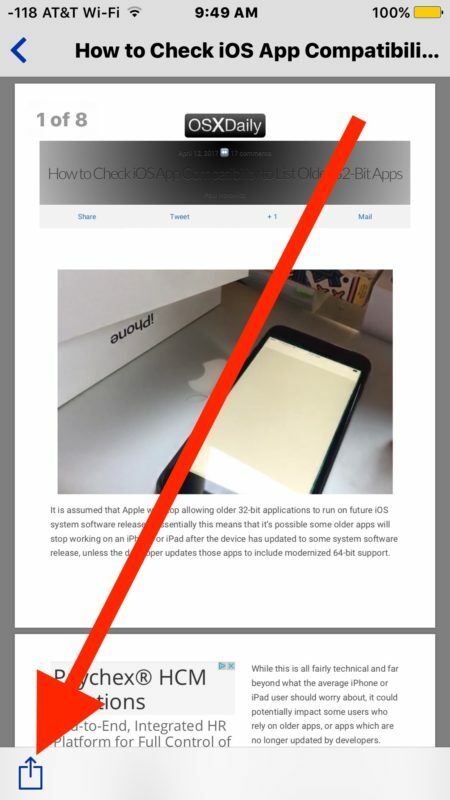 It’s only available in safari and it only sends the file to the ibooks app, whereas the print-and-zoom in method is available from any app that allows printing and it lets you send the file to any other app that can read pdf on your device, including icloud drive for access from other devices. In addition, if you use the save pdf to ibooks button the resulting pdf document will display the website url, time, date and page numbers on the bottom of each page, whereas if you use the print dialog and zoom in it won’t. Sorry. Didn’t see the iBooks at the end of the tips. I also convert to reader view like stated earlier, makes for a much better looking document. ‘save pdf to ibooks’ is only available from safari, though. 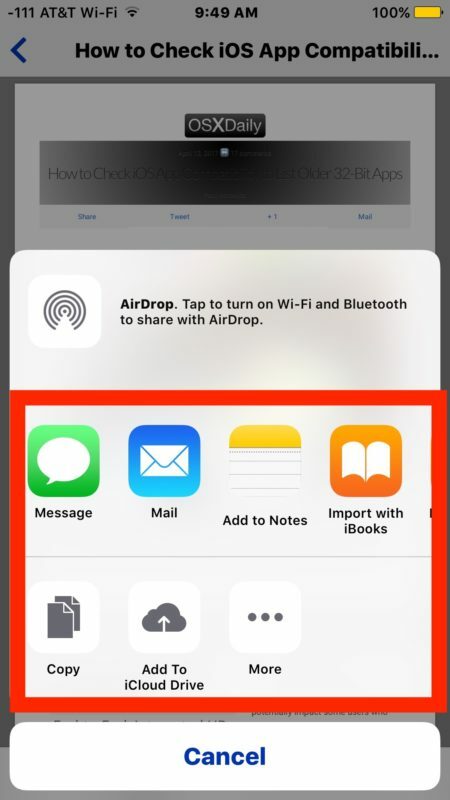 The other method, using 3D touch or a gesture from the print dialog, is available from any app that supports printing and it allows to send the file to any other app that supports reading or sending pdf files, giving it a more ch broader scope. I meant a much broader scope. How do you know this is a PDF? I don’t see that in any of the tutorial. It’s automatically made a PDF when one expands the preview image? This trick blew me away. Thank you so much! What if I need to include the web URL or other info in the header/footer? Thank you very much for the tip. It works. I’d found this beauty of a hidden treasure sometime ago, quite by accident. However, lately, after one of the IOS updates (somewhere from IOS 10.X to 11. X) my action box/button is completely inoperable. If so, can you PLEASE get ahold of me with any solutions you may have come across ? Here’s a URL link that also speaks to this incredibly useful pinch/squeeze action. I now remember that I was always looking for a way to “Save Emails As” and started poking, pinching, abs squeezing around on the print preview page and the email expanded with an action button available ! But, like I said above; I cannot get a long-press, short-press, or double-press to respond anymore. Works perfect!! Thanks so much for this! !